AVX 975G is a Bristol Lodekka FLF6G from the Eastern National fleet and was new in 1968. As can be seen, she has the usual ECW bodywork, but this time it’s in CH37/16F format, so she has "reversed" livery. The Tilling Group’s answer to the Ribble White Ladies? Hardly – I’d prefer not to think about how this combination would look with a full front! She’s seen at Wisley on 11 April 2010. These coaches were some of the very last FLFs to be built. Like most people I liked them but apparently the semi auto ones were not nice to drive. What a lovely picture – a classic very handsome vehicle of impeccable parentage showing clearly the dignity intensified by a very simple but bold livery. A very handsome vehicle – it makes one regret that so few colour photos exist of vehicles of the era that interests us. What express services did Eastern National operate? Was there a proper bus station at Kings Cross? Birch Bros. used to use the forecourt of St. Pancras Station as a terminus, if memory serves, from a week’s course I spent in a building opposite in 1959. There’s an audio clip of this vehicle on the Old Bus Sounds page of this site. Chris H, ENOC redeveloped the Tilling depot in Northdown Street into a coach station after it assumed management responsibility for Tilling – my dates are a bit vague, but there are some photographs of Northdown Street coach station on this site that were posted in response to a question I raised about the same some time ago. The volume of "The Years Between 1909-1969" (Crawley et als’ three-volume history of the "National" companies) that deals with ENOC (II or III?) will contain a detailed route history – I’m decorating my study at the moment, but I’ll have a route through the storage boxes tonight and try to post a list of ENOC express services operating in 1968 . . . unless somebody else gets there first (please!). It was May 1963 when Northdown Street coach station opened – all the London express services passed-through or terminated there. What a superb and classy combination of design and colour scheme – they just look as though each was specifically created for the other….Even the ‘bling-bling’ chrome wheel covers seem right, and you don’t say that very often when you’re talking about a double decker !! Your rooting was successful, Philip and I appreciate your finding out the routes. I’m amazed at the number and extent of ENOC’s Express routes, admittedly some joint, and the wide variety of places they went to as well. I don’t recall ever seeing any of their coaches, either in London, Southsea or Essex, when I periodically visited relatives in Colchester. Strange that. Did Tilling operators ever have DP vehicles and a hybrid colour scheme like the famous red and black NWRCC Willowbrook/Tiger Cubs ? Stuart, Wilts and Dorset had a d/p livery – standard tilling red below the waist-line, and a very dark maroon/red above, with a cream waist band and other cream embellishments. It looked very handsome. I don’t have any photos to add, but I am looking at an EFE model of a Bristol LS saloon decked out in this way, and I remember coming across them on various occasions in my youth. 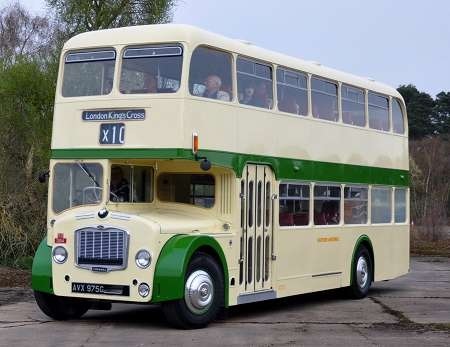 I think Bristol Omnibus also added more cream to their standard Tilling green/cream buses when they were d/p vehicles. Did they also add more green to some cream coaches when these were demoted? What a fine picture of a fine vehicle. Not readily apparent in the design is that from 1967 onwards, ECW adopted a one-piece glass-fibre assembly for the front upper deck of FLFs. The body outline remained unchanged, but the moulding extended from the front dome down to the top of the cream band above the cab, and as far back as the first side pillar. The practice was continued with the introduction of the Bristol VRT in 1968. For many years West Yorkshire kept a spare VRT front upper deck assembly in its Body Shop on Westmoreland Street in Harrogate. The assembly was suspended from the side of the gantry above the woodwork shop with strong ropes, and looked to be quite a substantial affair. Well Brendan that is a surprise and I for one never realised that such a one piece assembly had been designed by the wonderful Eastern Coachworks. Another brilliant "one piece" component, which always impressed me greatly, was at the rear of the lower saloons of the VRs. This was a beautifully styled affair which, quite apart from looking neat and pleasing, no doubt shielded the passengers from engine fumes and "soot marks" which were sadly often evident in many early rear engined double deckers. I was a conductor in Basildon in 1970 and conducted these to Kings Cross. We had special coloured Setright ticket rolls to use on the expresses. Intrigued by Philip’s list of services above, as there are two X2 and two X3 in the list London – Great Yarmouth or Southend/Sudbury – Brixham. I wondered if the latter had numbers determined by the joint operation, but the Royal Blue timetable has the Sudbury and Southend – Brixham service as X22, and joint between RB and ENOC (only). Similarly, the ENOC Southend – Ilfracombe X16 is listed as X23 in the Royal Blue book, and the X26 Southend – Bournemouth is X28 in the Royal Blue book. It seems the service was co-ordinated, but the service number not — and still leaves ENOC with two pairs of routes with the same number. (Not to mention two different X23 and X28 services at Southend). I am trying to find information about the former eastern national bus route No.30 that ran in the early 1960s between Chelmsford and London bow(Tomlins Grove) I used to see this bus parked up in Tomlins Grove on the to school in 1963 I was wondering what happened to this route regarding service withdrawal etc. as I moved away from East London when this bus route was still operating. The Service 30 to Bow was replaced on January 7th 1968 by a new Service 351 running Chelmsford – Brentwood and then following the 251 route to Wood Green. The weekday service was cut back to Romford in April 1971 as were the Sunday journeys in February 1973. In 2018, Service 351 runs half hourly between Chelmsford and Brentwood.